When I was asked to sew a dress-up princess dress, for a 4 year old, I just couldn't refuse. Interestingly, in the week that there was uproar in Ireland about pageants and beauty competitions for young children, I found myself sewing an extravagant princess dress! 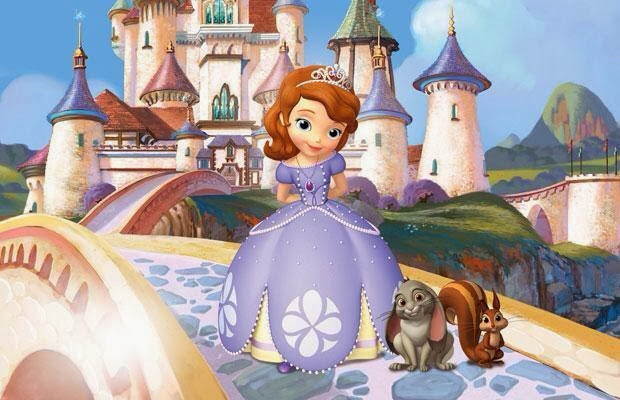 This was the first time I had ever heard of Princess Sofia the First, and following an Internet search, found plenty of dress pictures. 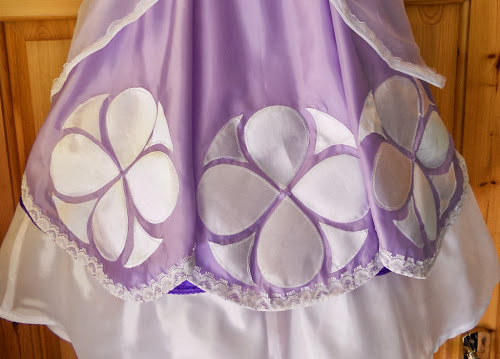 That white circular design on the skirt was giving me palpitations, so instead I focused on the style of the dress and what type of pattern would work. 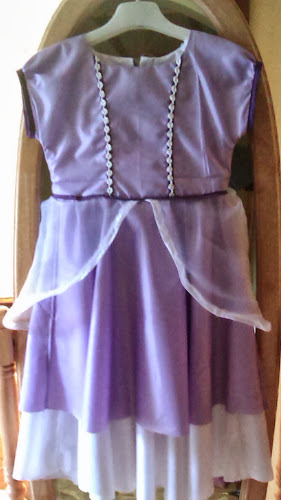 I considered a peasant dress style which would be accurate for the neckline, but decided that would make the bodice too blousy. Sleeves were another issue, as if they are very fitted, they can end up being too tight. I nearly danced a jig when this pattern, Simplicity 1922, turned up in my stash! View A (centre right) with loose sleeves, a wide neckline and bodice seams with layers of skirts, would be perfect for the princess Sofia dress. The pattern calls for binding and facings to finish the bodice. These can be complicated, instead I chose to line the bodice by cutting the main pattern pieces twice. I omitted the overskirt piece and used the main skirt piece to cut the both skirt and the longer underskirt and lining. 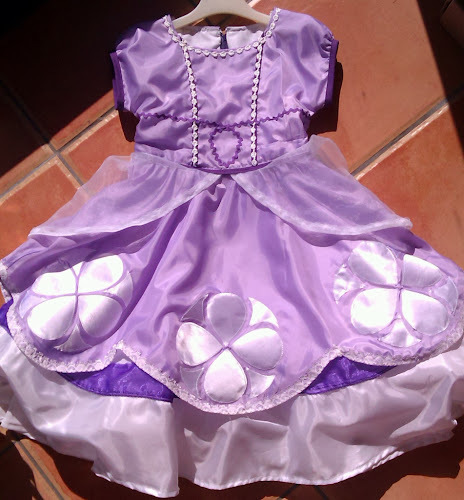 The side 'puffs' or peplums were cut from white organza and can be cut without a pattern. The lower edge is a deep 'u' shape and the upper edge is a shallow 'u' shape/curve, using half the waist measurement for the top edge. 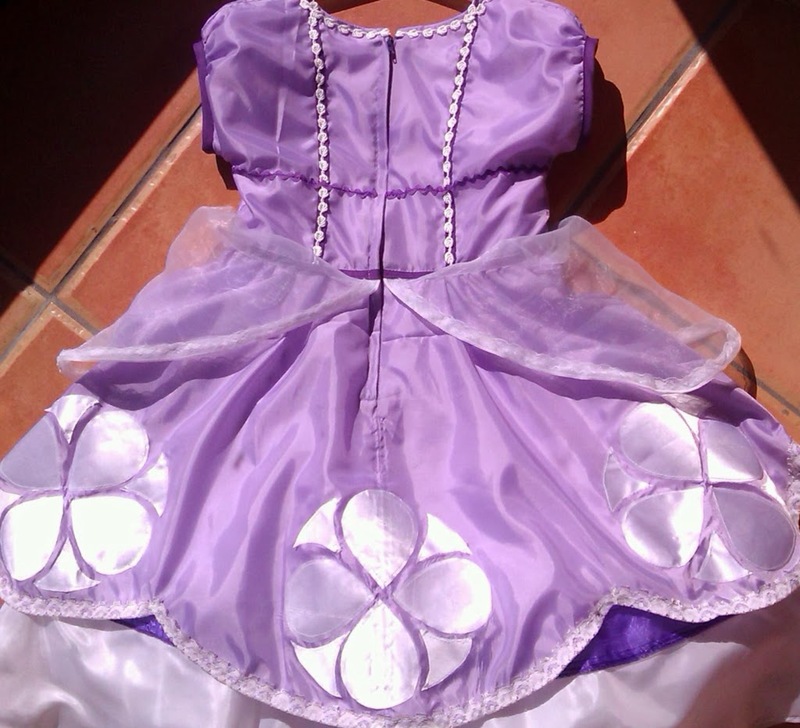 With some feedback from Helen on Instagram, I was so glad that to know it was starting to look like a princess Sofia's dress at this stage. ... and the inside front with no scratchy seams! The bodice lining is sewn into binding at the sleeve cuffs. This was the part of the dress I was dreading. I couldn't figure how the white circular design could be sewn to look as good as the picture. I considered white paint/stencil for the fabric, glueing on white fabric, and then I remembered I had some Bondaweb. It's basically adhesive with paper backing, which sticks to fabric and then allows the fabric to stick to more fabric. There are other similar products available, which may have different names, and which are used for appliqué. I had some of the white shapes cut, and still wasn't sure if the Bondaweb would work. I followed the instructions, and after pressing the shapes onto the skirt with a warm iron, just stood there looking at it in awe - it worked perfectly! I sewed around all of the shapes to ensure the design wouldn't come off in the wash. It was a quite a sewing marathon, as I sewed it over 3 days. In all about 12 hours work went into it, though that was not all sewing time. Being one of the first times that I noted the number of hours of work and the time that goes into a dress like this, it was a bit of a eye opener! Wow...12 hours!?! The dress is fabulous, Angela. As soon as I saw the first picture, I thought to myself that it looked like a Sophia the First dress!;) . I know, all the little bits added up - appliqué, binding, lining ...... I was checking all the images I found of the dress for details that I could include, I'm glad to know I got it right! Great dress! Sofia is also very popular in USA so I am sharing this with sewing friends who are looking at how to make it! Thanks Kathy, I'm delighted you're sharing it :-) If anyone wants more information or help, they can email me. Angela, how did you do the scallops? I did them when I had the dress almost sewn! but it would be easier to do them on the front & back skirt pieces, before sewing them together! There are 3 appliqués on the front & 3 on the back, so I marked the 6 high points of the scallops, evenly all around the skirt (I wanted to do them higher, but didn't have enough trim!) I drew a line with chalk to mark the scallops (use a large plate or curved ruler), then using a long straight stitch, I sewed the trim on the marked curves/line, folding it a little at the high point of the scallop. Then the fun part!- I cut straight lines from the lower edge of the skirt to each high point as far as the stitching/trim. I folded the trim (2.5cm wide) under to the wrong side, and zig-zagged it all around close to the edge, reinforcing it at the high point of the scallops. The excess skirt fabric was then cut off very close to the trim on the wrong side. Thanks for stopping by. 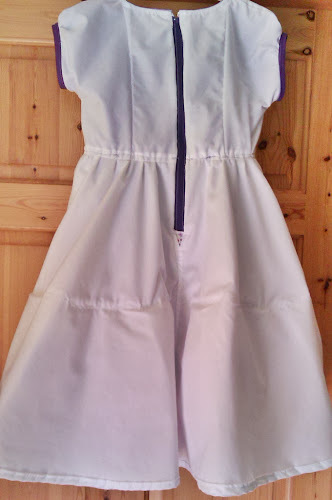 An Irish mother of 4 living in the beautiful south-west of Ireland, I started sewing late 2008 and love how it lets my (long-lost) creativity shine. This is where I post pictures of what I sew, interspersed with some bits of my life. Not having anyone very (or even obsessively!) interested in sewing "in real life", I love to get any feedback on what I make. So if you would like to comment about anything here, I would be delighted to hear from you. Solely Sewing | Sewing, Dressmaking, Alterations, Crochet. 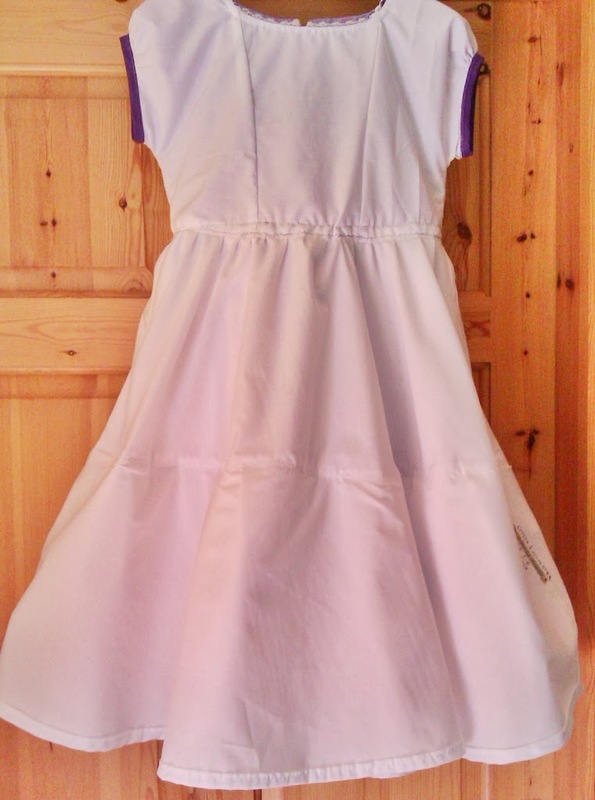 maevesshed | All about my hobbies – dressmaking in my room in the shed, the odd bit of knitting and making/eating cakes. All text and pictures on this blog are (c) sewnbyangela, 2008-2014 unless otherwise credited. Just. Simple theme. Powered by Blogger.